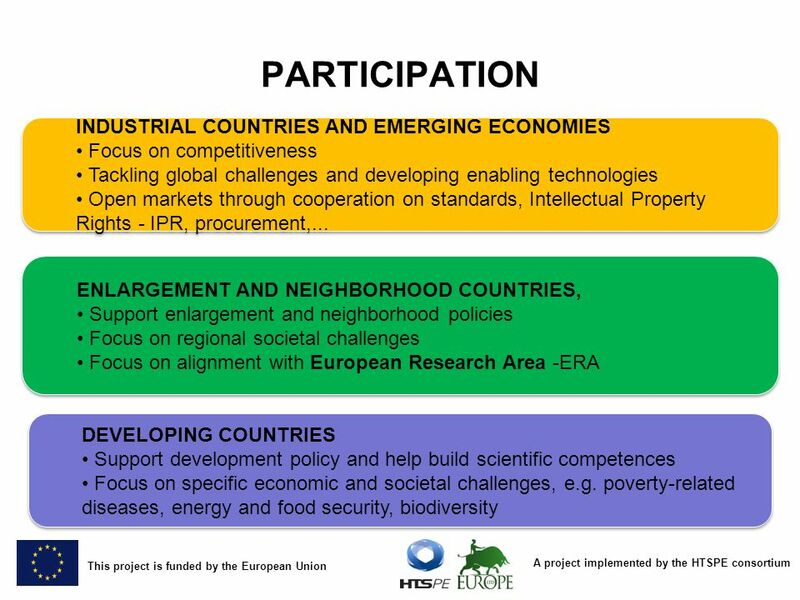 A project implemented by the HTSPE consortium This project is funded by the European Union SMART AND INCLUSIVE GROWTH. 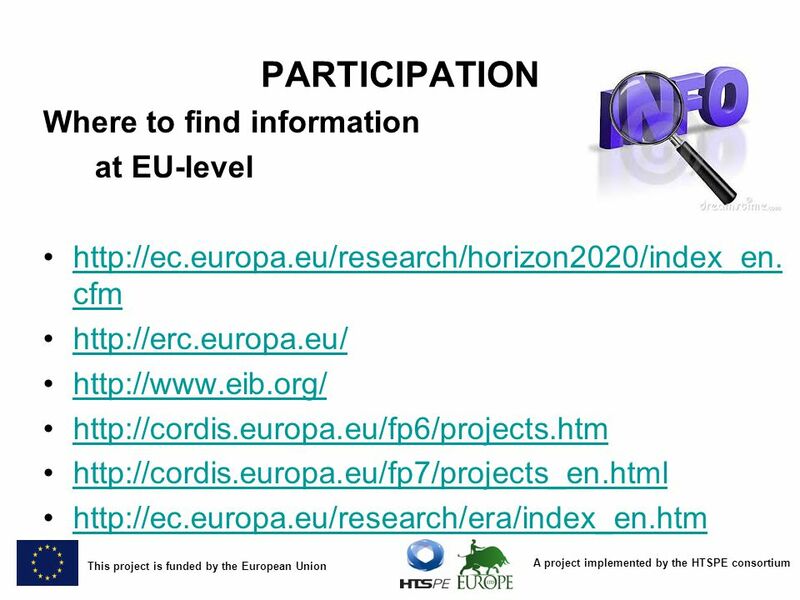 4 A project implemented by the HTSPE consortium This project is funded by the European Union PROGRAMME STRUCTURE Key novelties in Horizon 2020 A single program bringing together three separate programs / initiatives : The Research Framework Program Competitiveness and Innovation Framework Program EU contribution to the European Institute of Innovation and Technology (EIT) Coupling research to innovation - from research to retail, all forms of innovation Focus on societal challenges facing EU society, e.g. health, clean energy and transport Simplified access for all companies, universities, institutes in all EU countries and beyond. 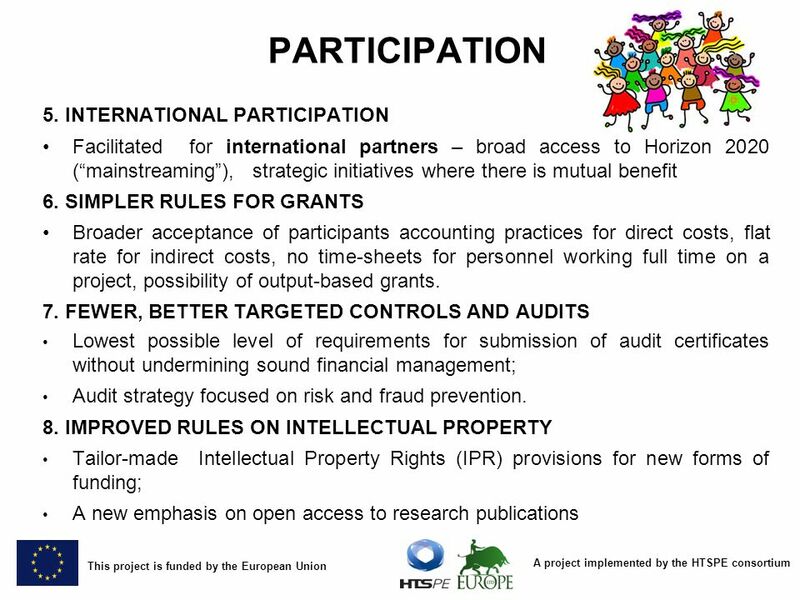 8 A project implemented by the HTSPE consortium This project is funded by the European Union PARTICIPATION ELIGIBILE COUNTRIES Horizon 2020 will be to the EU countries, to acceding countries, candidate countries and potential candidates, in accordance with the general principles and general terms and conditions for the participation of those countries in Union programmes established in the respective framework agreements and decisions of association councils or similar agreements; TARGET GROUPS Excellent Science -Independent researchers of any age, including starting researchers making the transition to being independent research leaders in their own right, from any country in the world will be supported. 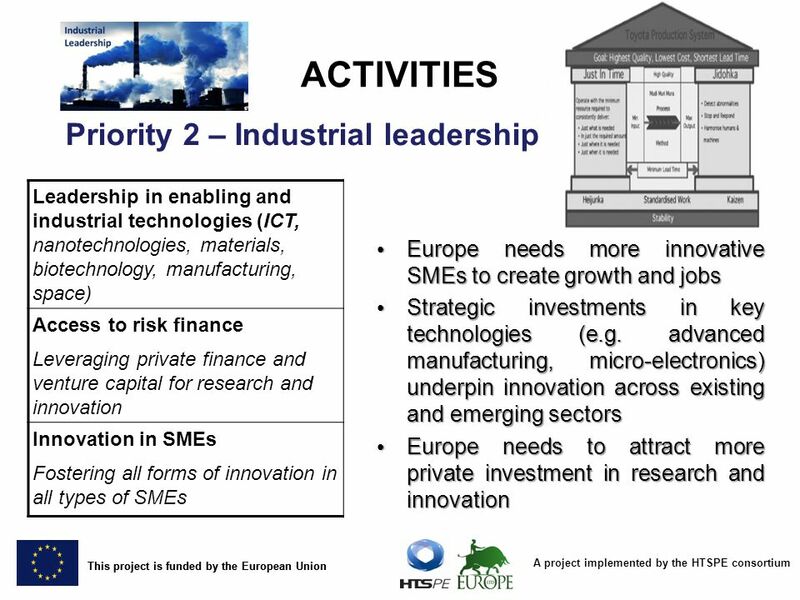 Industrial Leadership -horizontally SMEs are the main target group Under "Industrial Leadership" component Access to Risk Finance is targeting SMEs and the component "Innovation in SMEs" is dedicated to SMEs. COSME and Horizon 2020 will be complementing each other. 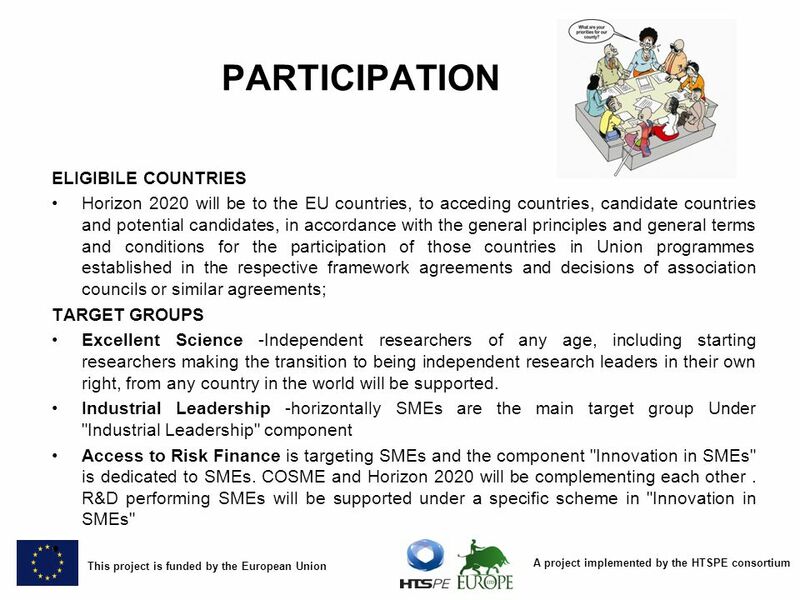 R&D performing SMEs will be supported under a specific scheme in "Innovation in SMEs"
10 A project implemented by the HTSPE consortium This project is funded by the European Union PARTICIPATION 1. 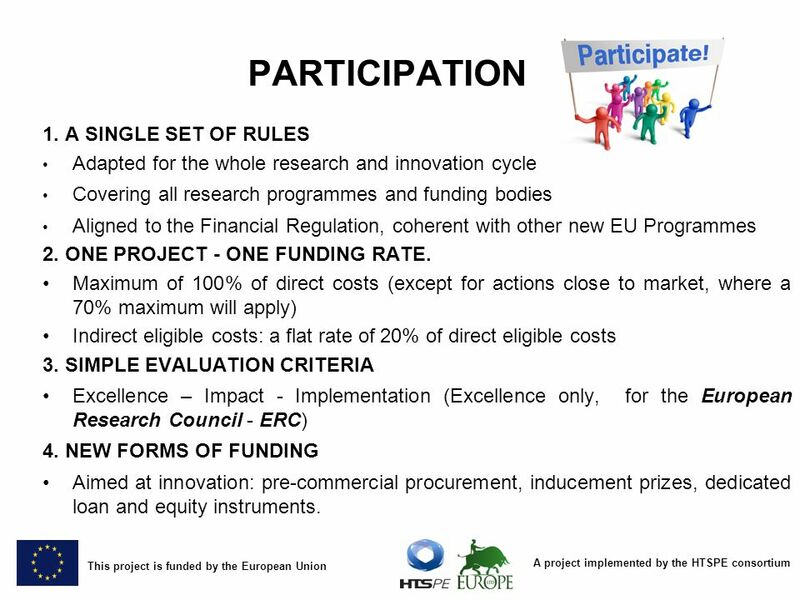 A SINGLE SET OF RULES Adapted for the whole research and innovation cycle Covering all research programmes and funding bodies Aligned to the Financial Regulation, coherent with other new EU Programmes 2. ONE PROJECT - ONE FUNDING RATE. Maximum of 100% of direct costs (except for actions close to market, where a 70% maximum will apply) Indirect eligible costs: a flat rate of 20% of direct eligible costs 3. 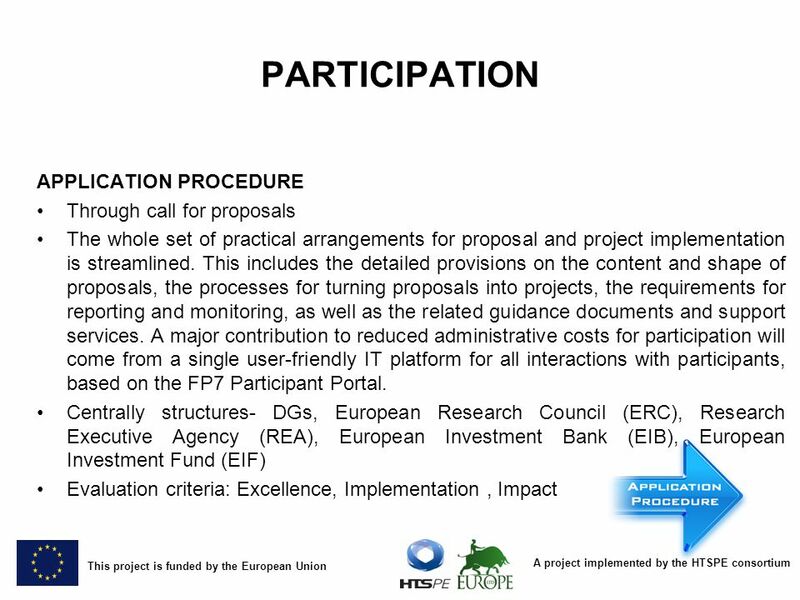 SIMPLE EVALUATION CRITERIA Excellence – Impact - Implementation (Excellence only, for the European Research Council - ERC) 4. NEW FORMS OF FUNDING Aimed at innovation: pre-commercial procurement, inducement prizes, dedicated loan and equity instruments. 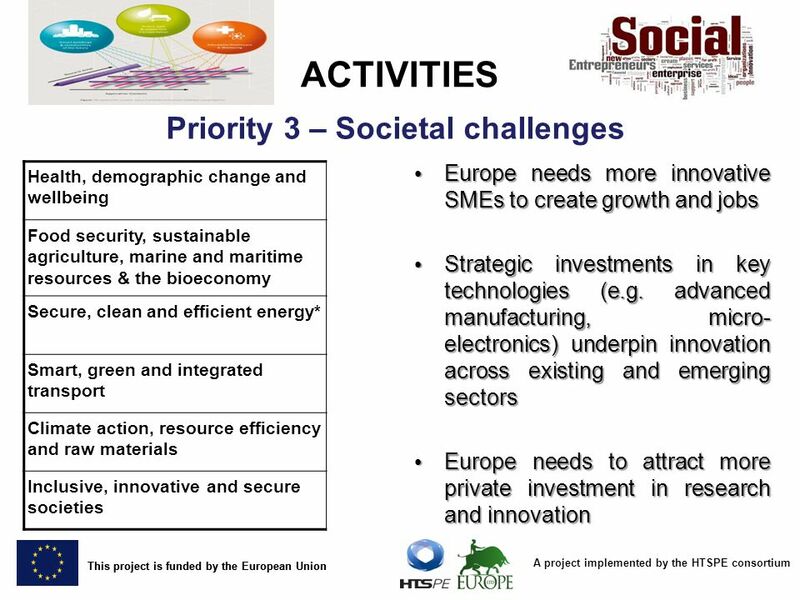 Download ppt "A project implemented by the HTSPE consortium This project is funded by the European Union SMART AND INCLUSIVE GROWTH." 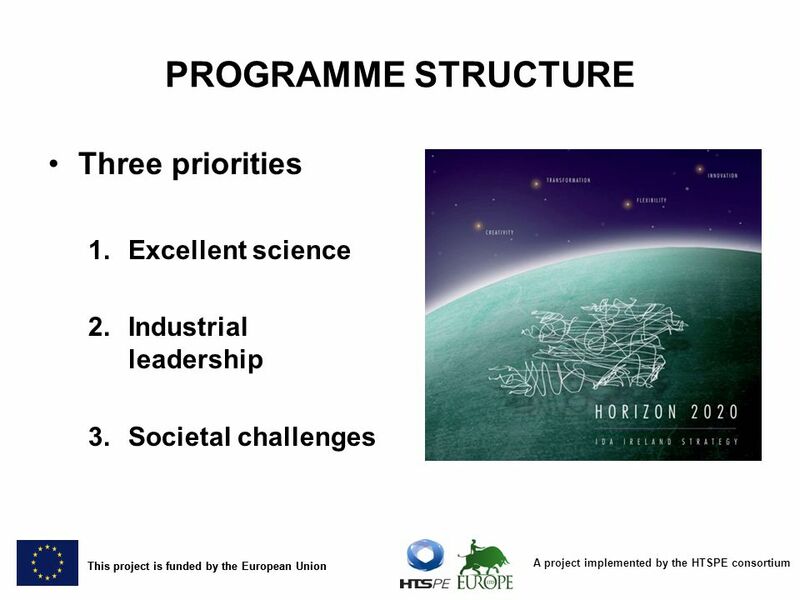 04/12/2013 HORIZON 2020 The New EU Framework Programme for Research and Innovation Maive Rute DG Research & Innovation European Commission. Project BEBB Better Environment – Better Business LOGO HERE. Environment Marine Energy Horizon 2020: Turning New Ideas into Innovation Dr. Martina Prendergast Ryan Institute, NUI Galway SMART GRID TECHNOLOGY WATCH. The Structure and Goals of the Horizon 2020 Programme Central European Days for the EU Research, Prague, HORIZON 2020 Wolfgang Burtscher Deputy. The New EU Framework Programme for Research and Innovation HORIZON 2020 HORIZON 2020 REGIONAL LAUNCH EVENT FOR WESTERN BALKANS Wolfgang Burtscher. The EU framework programme for research and innovation Ruxandra Draghia-Akli, MD, PhD Director, DG Research and Innovation Bucuresti, 10 ianuarie 2012. 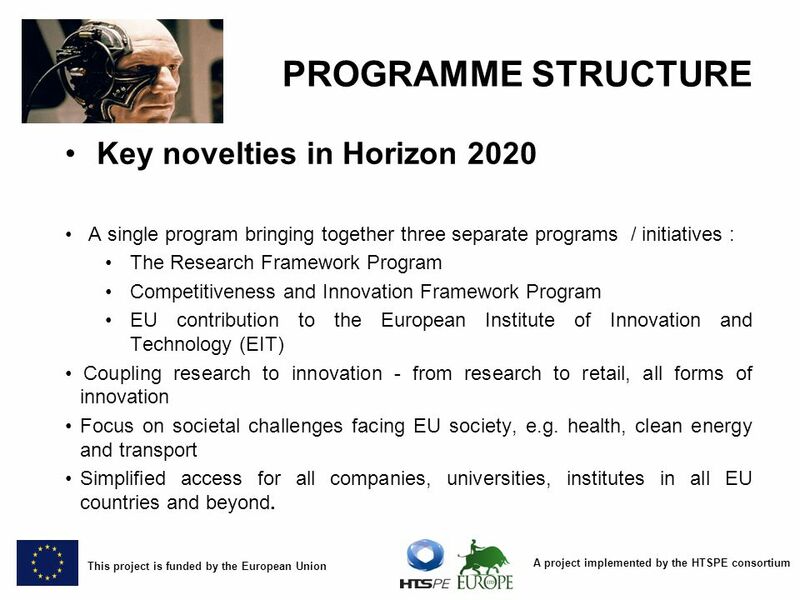 04/12/2013 HORIZON 2020 The New EU Framework Programme for Research and Innovation Telemachos TELEMACHOU DG Research & Innovation European Commission. 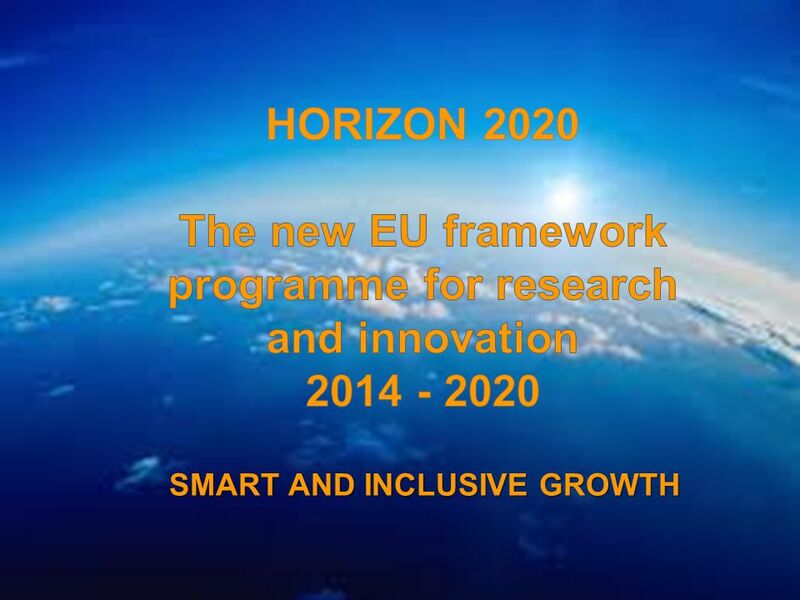 HORIZON 2020 The New EU Framework Programme for Research and Innovation Ms Martina Angelini. 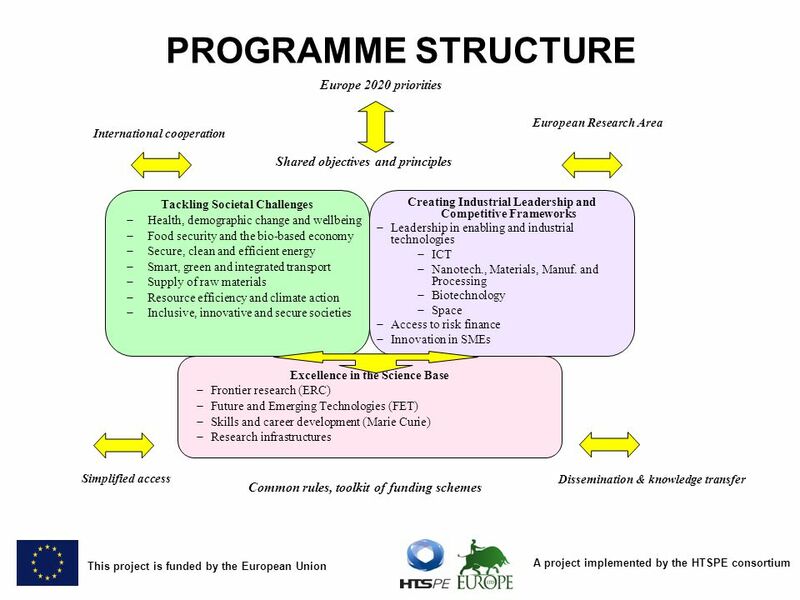 EU Funding: The European Research Council Nikki Muckle Strategy & Change – Research Strategy. 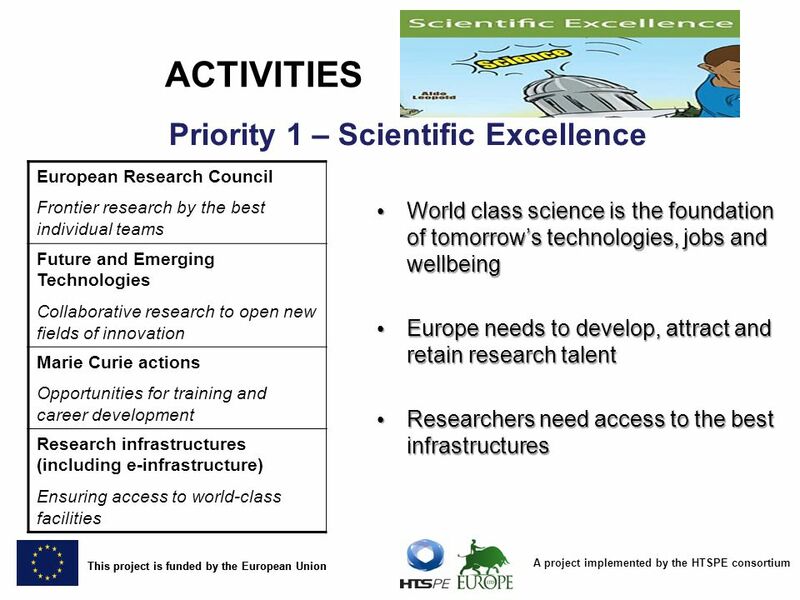 The New EU Framework Programme for Research and Innovation 2014-2020 HORIZON 2020 Octavi Quintana Trías European Commission - Principal Adviser.